Passing a kidney stone can be a painful experience. And kidney stones often recur. According to Roger L. Sur, MD, director of University of California San Diego Comprehensive Kidney Stone Center, if you've had one kidney stone, there is a 50 percent chance that you will develop another within five to 10 years. Although there are various strategies to prevent recurrence, you may be wondering what to do when you actually have a stone. Lemon juice is an alternative therapy; consult a health care professional before using it. Kidney stones occur when minerals and other substances in the urine combine to form a solid mass. The most common type of kidney stone is calcium-based; the calcium combines with oxalate or phosphate. Other types of kidney stones include uric acid, struvite and cysteine. Some stones will pass by themselves, but others may require medical treatment such as lithotripsy – crushing stones using shock waves – or surgical removal. None of the conventional treatments dissolves stones. 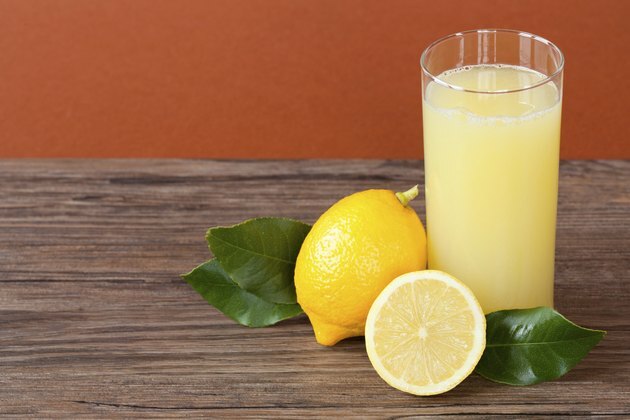 Citrate or citric acid is common in citrus fruit, and lemons are an excellent source, according to a study published in the March 2008 "Journal of Endourology." Researchers compared lemons, limes, grapefruit and orange juice to determine the best source of citric acid. Citric acid helps to prevent kidney stones by increasing the acidity of the urine. One of the conventional medical treatments for kidney stones is potassium citrate, a form of citric acid combined with potassium. Dr. Edward Group, a naturopathic physician and founder of Global Healing Center, Inc., has a favorite kidney stone remedy. At the first sign of pain, drink 2 oz. of organic olive oil mixed with 2 oz. of organic lemon juice. Follow with 12 ounces of purified water and wait 30 minutes. Squeeze the juice of 1/2 lemon in 12 oz. of purified water, add 1 tbsp. of organic raw apple cider vinegar, and drink. Repeat the lemon juice, water and apple cider vinegar recipe every hour until symptoms improve. As with starting any new treatments, consult your doctor first. There is no scientific evidence to support the idea that lemon juice actually helps to dissolve a stone. Dr. Group does not state how his treatment works and provides no data to support his recommendations. If you have kidney stone symptoms – back, abdominal or groin pain, nausea and vomiting, chills or fever – contact a health care professional.